The City of Yarra is upgrading the rather bumpy section of the Capital City Trail between St Georges Road and Bennett Street, and detours are in place. 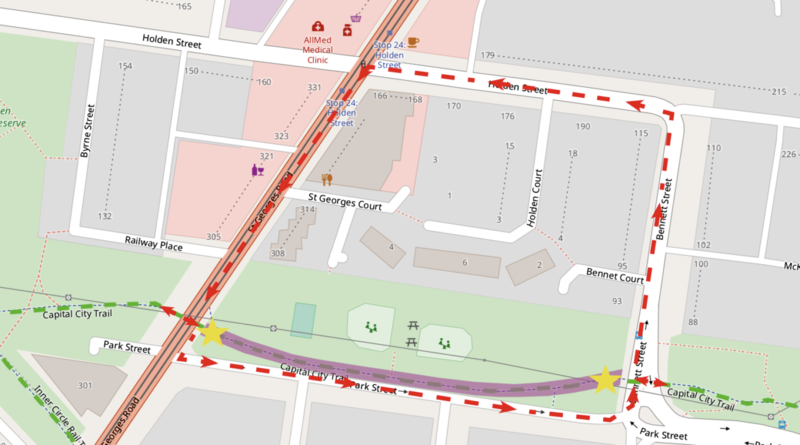 The detours are along Holden Street and St Georges Road, which are on-road facilities. The project will replace about 200 metres of rough asphalt with new, 3 metre wide concrete along the same alignment. The shared path will be closed to bike riders and pedestrians for the duration of the works, expected to be completed in early March. Detours will be in place for bike riders westbound along Park Street and eastbound along Bennett and Holden streets and St Georges Road. Pedestrians will be directed to use Park Street footpaths. Click here or on the image of the map for a more details.